Neighborhoods have a fabric that binds them together, making them desirable places to be. Variation in the fabric creates charm and interest; tears in the fabric damage its integrity. Here is Linden Street North in Northfield. It is a street lined with modest homes, most of which are one-story ramblers with a basement. 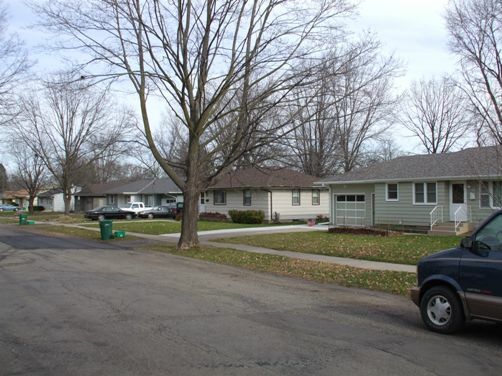 These homes seem well sized for their lots; appropriately separated from each other. Here is a recent duplex built where a similar rambler once stood. These buildings are right next to those above. In my option, this is a tear in the neighborhood fabric. This is exactly the stuff Minneapolis neighborhoods recently reacted against. Minneapolis revised their zoning ordinance to encourage more traditional forms and to simply limit the size of the building allowed on a residential lot. They did this in a few ways. FAR, or floor area ratio, was limited to 0.5. This means that for a 5,000 square-foot lot, the maximum house size is limited to 2,500 square feet total. 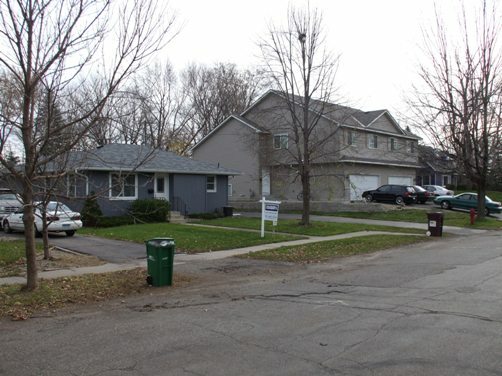 2,500 is still a fair sized home, much larger than the average existing home in Minneapolis. Home height was also limited to 30 feet instead of 35 feet. This resists the seemingly common desire for newer homes to tower over existing neighbors. Incentives were offered for detached garages, which do not count toward the FAR. Front porches and other traditional detailing earn points toward complying. And “natural grade” was defined, requiring minimal changes to the grading a lot had before changes. This was designed to prevent two-story houses from rising too far out of the ground which creates a high building mass. The idea was to promote traditional basements instead of “look-out” basements. For the specifics, see the Minneapolis Zoning Code, Title 20, Section 546.240. The Minneapolis zoning ordinance was revised in June 2007; time will tell if these changes have protected the character of Minneapolis residential neighborhoods. Northfield should be proactive in changing its zoning codes to likewise protect itself. The following came to me via e-mail from a local resident. I agree. Gentrification may not be the case here (yet), but we do want to be careful about respecting the scale of our neighborhoods as we consider allowing more density.